Singer Alicia Keys didn’t intend to start a movement when she went makeup free earlier this summer. In the past few months, we’ve seen more and more celebrities joining the No Makeup movement. From JLo to Demi Lovato, #nomakeupmonday has taken social media channels like Instagram and SnapChat by storm. 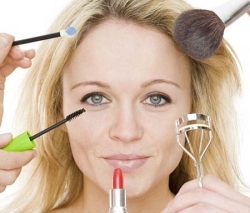 But in order to really embrace the no makeup look, you must make sure you skin is in tiptop shape. SheaMoisture’s skincare line will have you looking radiant and help you join the no makeup movement in no time. If you have dry skin, the following combination with help create a more hydrated canvas, that will have you posting #nofilterneeded selfies for the rest of the year. SheaMoisture Peace Rose Oil Complex Mud Mask, SheaMoisture Peace Rose Oil Complex Facial Moisturizer, and SheaMoisture 100 percent Pure Monoi Oil. To begin this look, apply the SheaMoisture Peace Rose Oil Complex Mud Mask that contain shea butter and rose oil that cleanse and soften skin. Follow with the SheaMoisture Peace Rose Oil Complex Mud Mask Moisturizer that hydrates and comforts skin with the proprietary Peace Rose Oil Complex. Finally, put a few drops of the SheaMoisture 100 percent Pure Monoi Oil that contains Vitamin E, antioxidants, and fatty acids that will leave you with a luminous glow. SheaMoisture Superfruit Renewal Facial Wash and Scrub, SheaMoisture Renewal Eye Cream, and SheaMoisture 100 percent Pure Baobab Oil. Start this look with the SheaMoisture Superfruit Renewal Facial Wash & Scrub to clean and exfoliate skin. The combination of raspberry ketones, goji, acai and guava help improve your skin’s texture. Follow with the SheaMoisture Superfruit Renewal Eye Cream to soften the delicate skin around the eyes. Finish with the SheaMoisture 100 percent Pure Baobab Oil that repairs skin tone with Omegas 3,6 y 9 and help you achieve an even skin tone.